The evidence for evolution - How can evolution be observed? Evolution can be produced in the laboratory with artificial selection experiments. In a typical experiment, a new generation is formed by allowing only a selected minority of the current generation to breed. The population will almost always respond: the average in the next generation will have moved in the selected direction. The procedure is used in agriculture: artificial selection has been used to alter the numbers of eggs laid by hens, the meat properties of bullocks, and the milk yield of cows. In an experiment, rats were selected for increased or decreased susceptibility to dental caries on a controlled diet. As the graph shows, the rats could be successfully selected to grow better or worse teeth. Evolutionary change can therefore be generated artificially. Figure: Selection for better and worse teeth in rats. 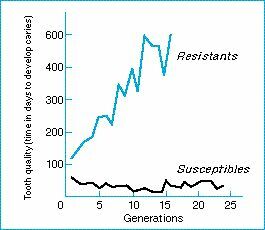 Hunt et al bred from rats that developed caries later (resistants) or earlier (susceptibles.) The age in days at which the rats in the two lines developed caries was measured.